"The No. 1 killer in America is not guns, car accidents, or murder; it’s the confusion about what dietary advice will solve obesity and diet related chronic disease. Putting a face we recognize on the obesity epidemic is not only shocking, but identifies why that question is the most important health question of our time - it's the equivalent of one 9-11 every three days," says disabled filmmaker C.J. 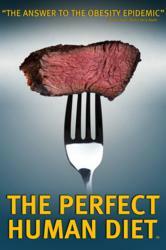 Hunt, whose movie "The Perfect Human Diet" premieres on iN DEMAND April 1. In "The Perfect Human Diet," #1 Independent Film, #1 Documentary and Top-10 Movie iTunes USA and Canada in January 2013 (@PhDdocumentary, #ThePerfectHumanDiet), Hunt takes an unprecedented global search to find the answer to that critical question. Thanks to exploring the unconventional, and some new hard science, he discovered the unexpected solution the obesity epidemic and diet related chronic disease, the authentic human diet, something that was previously unknowable. From excavations containing the remains of Neanderthals and early Modern Humans in Jonzac, France, to the bio-molecular anthropology analyses labs at the Max Planck Institute for Evolutionary Anthropology in Leipzig, Germany, Hunt discovered breakthrough scientific facts that will change the way we all think about food. Top-Health Blogger Mark Sisson (of Mark’s Daily Apple) calls the film, “The answer to the obesity epidemic." Featuring rare interviews with some of the foremost authorities on evolutionary anthropology and human evolutionary nutrition “The Perfect Human Diet” offers a new opportunity to see what our species needs to reclaim optimal health, and most importantly, solve the obesity epidemic and diet related disease. See the trailer online now at http://www.youtube.com/embed/ndH6QGyovy0. About C.J. Hunt: “The Perfect Human Diet” evolved from Mr. Hunt’s true-life story, beginning in 1978 when paramedics brought him back to life at 24 after suffering a full cardiac arrest while jogging. This incident evoked an intense passion to find out how we can all achieve longer, healthier and happier lives and then share that information with others. Mr. Hunt is a Broadcast Journalist, Producer and Host with over twenty years in broadcasting, is the author of two books on diet and health and co-founder of Hunt Thompson Media.